I hope you had an enjoyable and peaceful Christmas last week. In keeping with the spice theme ( cinnamon, ginger, and nutmeg), this time a focus on cloves, another type of spice that is often part of holiday fare. The word “clove” comes from the Latin word clavus, which means “nail” — appropriately named if you’ve ever looked at a whole clove. It’s actually an unopened flower bud from the clove tree, an evergreen that can grow as tall as 40 feet. Like nutmeg, clove originates from the “Spice Islands,” which are located off Indonesia, but it is also grown in various other locations, including the West Indies, Brazil, Mauritius, Madagascar, India, and Sri Lanka. Cloves were big in the Chinese Han Dynasty — visitors of the emperor were required to hold cloves in their mouths for breath-freshening purposes while speaking with him (clove is still used today in some mouthwashes!). Commercial trading of cloves began in earnest with traders from the Middle East; cloves soon became a precious commodity, much like black pepper. Source of manganese. Interestingly, cloves are super-rich in manganese, a trace mineral necessary for protein and carbohydrate metabolism, the synthesis of fatty acids and cholesterol, proper functioning of the thyroid gland, blood glucose control, and bone health. Cloves also contain, in lesser amounts, omega-3 fatty acids, vitamin C, vitamin K, and fiber. Anti-inflammatory. Eugenol is a substance found in clove oil that has anti-inflammatory properties, possibly making it an anticancer agent (however, anyone who has cancer is advised not to use cloves because some animal studies indicate it may also have slight tumor-promoting properties). Eugenol also contains flavonoids that help boost its anti-inflammatory abilities. Dental pain reliever. In addition to its anti-inflammatory ability, clove oil has anesthetic and analgesic (pain-relieving) properties, too. Clove oil or ground clove is an old remedy for toothaches. Dentists use clove oil in temporary fillings to not only help alleviate pain but also as an antimicrobial agent. If you have a toothache, you can moisten a cotton ball with a little bit of clove oil that has been diluted with olive oil and put it on the affected tooth for temporary relief. Reliever of digestion woes. In ancient Chinese and ayurvedic medicine, clove tea has traditionally been used to help relieve digestive problems, including stomach ulcers, bloating, gas, nausea, and diarrhea. Cloves also help to calm down the smooth muscles of the digestive tract. Insulin sensitizer. A small number of studies have shown that clove extract capsules (in the amount equivalent to taking one to two cloves per day) boost insulin function and lower glucose (along with cholesterol and triglycerides) in people with Type 2 diabetes. Natural antibacterial, antiviral, and antifungal agent. Cloves can kill off intestinal parasites and treat fungal infections, including athlete’s foot. 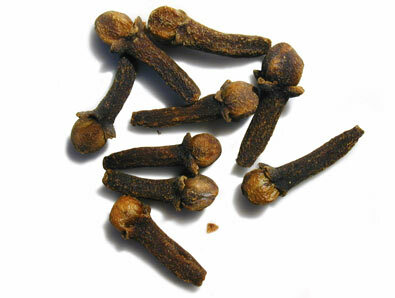 In some countries, cloves are used to treat malaria, tuberculosis, and scabies. Mosquito repellant. Clove oil has been shown to repel mosquitoes for up to two hours; however, undiluted clove oil can be irritating to the skin in some people. As always, when taking spices or herbs for medicinal purposes, it’s important to check with your health-care provider. Cloves are no exception. Eugenol can cause allergic reactions (some quite severe) in sensitive people, including rashes, itching, shortness of breath, and hives. The amount of clove that you might use in cooking is considered safe. But large amounts may cause vomiting, seizures, difficulty breathing, and kidney and liver failure. Children and pregnant women should avoid taking clove supplements. Clove can interact with blood-thinning medicines, including aspirin and clopidogrel (brand name Plavix), non-steroidal anti-inflammatories, such as ibuprofen (Advil and others) and naproxen (Aleve and others), and antifungals, antihistamines, and cardiac medicines. Sure, you can stud your holiday ham with cloves. But branch out a little. Stick whole cloves in an onion to flavor soup. Sprinkle some ground clove into apple cider, mulled wine, barbecue sauce, or a favorite curry recipe. Ideally, buy cloves whole and use a coffee grinder to grind them into powder.